It’s no secret that one of the keys to successful marketing is robust analytics — using data and the insight it provides to share the right message with the right account holder or prospect at the right time. 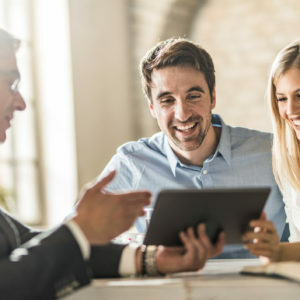 But what may not be so widely known is that financial institutions can increase the effectiveness of their marketing and enhance return on investment (ROI) by expanding their view of analytics and making it a process to be engaged in throughout the account holder lifecycle, rather than an event related to creating an acquisition, cross-sell or other single-focus program. Taking a longer-term view is particularly important in light of recent research conducted by Harland Clarke. It shows that as a consumer moves along the lifecycle continuum from a prospect to a loyal customer or member who offers referrals to the institution, the ROI derived from that relationship increases exponentially over time (see Figure 1). 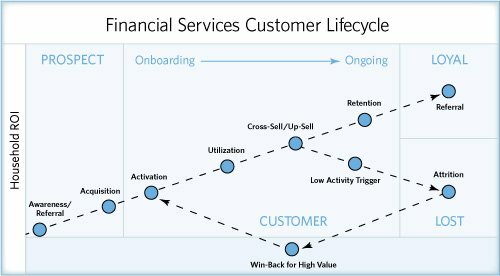 Although there are many components to the account holder lifecycle, analytics plays a vital role during three primary phases: acquisition, onboarding and cross-sell. Here are some specific ways analytics can be used to enhance effectiveness in each stage. Whether the goal is to pursue new segments of account holders or attract a particular demographic as a way to acquire brand new households for the institution, the lead product chosen for an acquisition campaign can significantly impact profitability. 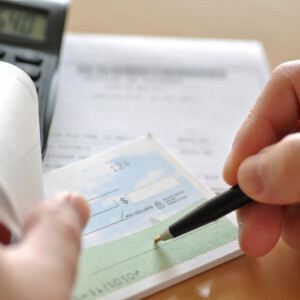 For example, marketing a DDA product not only increases the likelihood that the institution will become the primary banking relationship with the consumers it attracts, but it also provides many opportunities to sell additional products and services, including loans and investments, to these households over time. However, if a loan or an investment is the lead product in a campaign, the institution has less of an opportunity to sell other products and services. When considering lifetime value of an account holder relationship, this type of insight provides a smart pathway toward both acquiring the right type of account holder with the right product and understanding the overall revenue impact of marketing efforts. 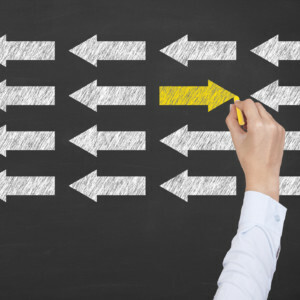 Effective onboarding strategies further the momentum captured during acquisition campaigns and help stem the tide of attrition among new account holders. 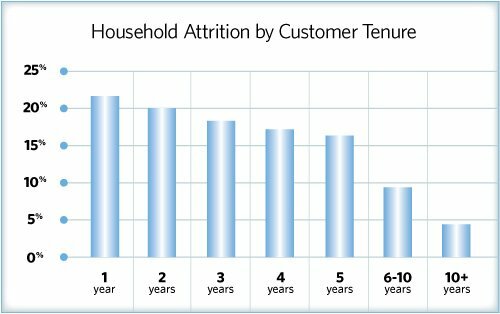 Information from the Harland Clarke National Banking Industry Database indicates that household attrition during the first year of the relationship is 22 percent — much higher than the attrition rate among established customers (see Figure 2). 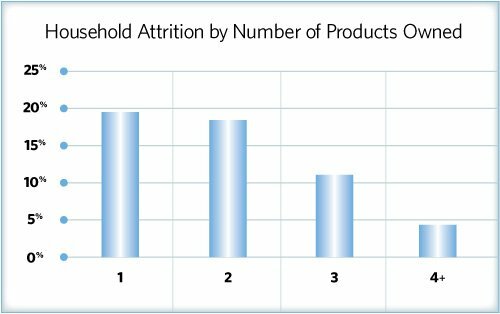 It also shows that attrition decreases as the number of products per household increases (see Figure 3). That is why engaging account holders with sticky services that they activate and use, such as debit cards, checks, online bill pay and online banking, is critical during the first 45 days and, indeed, throughout the first year of the relationship. Insightful data can help determine the cadence for onboarding communications — the messages that should be included and the type and timing of the touchpoints. Additionally, testing the effectiveness of communications during the onboarding phase can show how important it is to promote sticky services during the early months of the relationship, and when it is time to start focusing on the next phase of marketing communications. Established account holders who have activated some sticky services are ready for cross-sell messages. Here analytics can help segment account holders based on their risk of attrition or their propensity to purchase products, and identify which products and services the account holders with the inclination to buy will likely purchase next. Retention is a key subcomponent of cross-sell, and with informative data, financial institutions can calculate how much they want to invest to keep account holders by segment or value. Churn analytics aids with proactive retention efforts and provides behavioral trends of account holders who may be migrating to another institution and what can be done to retain them. Reactively, an institution could provide a series of win-back offers to account holders with high value. Within 60 to 90 days of account close, institutions also have the opportunity to recapture former account holders experiencing a form of buyer’s remorse — those who found the grass was not greener with another bank or credit union and might welcome a win-back offer. Far from being a one-time event, analytics is the slow burn that powers marketing efforts throughout the lifecycle. The results speak for themselves — greater insight for financial institutions about where to focus marketing budgets, and higher ROI. Mr. Kharidhi is vice president of analytics and business intelligence at Harland Clarke. He can be reached at sandeep.kharidhi@harlandclarke.com.